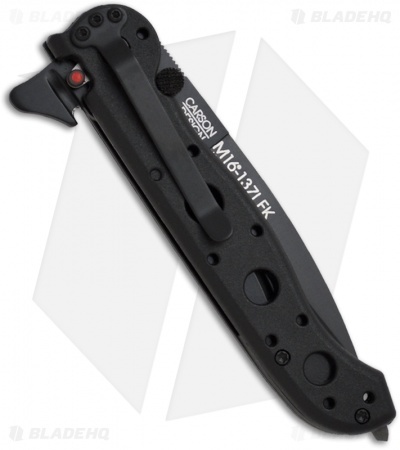 The CRKT M16-13ZLEK features a black Ti-Nitride finished AUS-8 stainless steel spear point blade with a partially serrated edge. 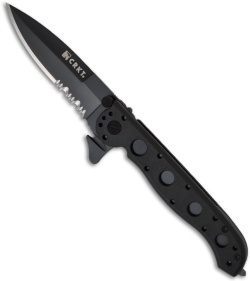 The handle has black Zytel scales and a tip-down pocket clip. Unique to this model is a seat belt cutter on the Carson Flipper and a tungsten carbide window breaker at the base of the handle. The Kit Carson designed CRKT M16-13 is ready to tackle any job in your day-to-day endeavors and then some. The Zytel InterFrame handle has 420J2 stainless steel liners and CRKT's AutoLAWKS knife safety, which automatically actuates when the blade is open making it a virtual fixed blade. The blade is easily opened with the dual thumb studs or a push of the Carson Flipper. The Teflon bearings at the blade pivot and an adjustable pivot screw allow for perfect blade action. It's great for the price but very stiff out of the box, the little screw on the liner lock often gets in the way of closing the blade.